April 26-May 19, 2019. Fri-Sat 7:30pm; Sun 2pm. The submissions window will close May 31, 2019. If you have questions, please email info@vortexabq.org. 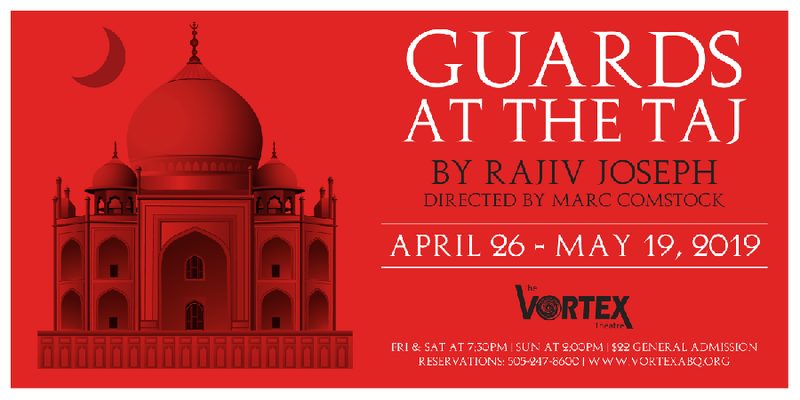 See Guards at the Taj this Friday and Saturday and bring a friend for free! Tickets are on sale for a special two-for-one price (singles $12). This amusing and touching play—inspired by myths related to the fate of the building's builders—won the 2016 Obie Awards for Best New American Play and Performance and the 2015 Laurents/Hatcher Foundation Award. For five years, The Vortex's annual Shakespeare festival has been "Shakespeare on the Plaza" and for four years before that it was "Will Power." Welcome to the next, and best, phase: The New Mexico Shakespeare Festival.